This is a spontaneous salad that was thrown together at the very last-minute as we were about to have company over and I was a bit unsure if I had enough sides for our impromptu bbq. This salad is very similar to an edamame and carrot salad that I have made on many occasions. With the abundance of celery in the fridge and no carrots, the result was a wonderful crisp, refreshing, and light salad. 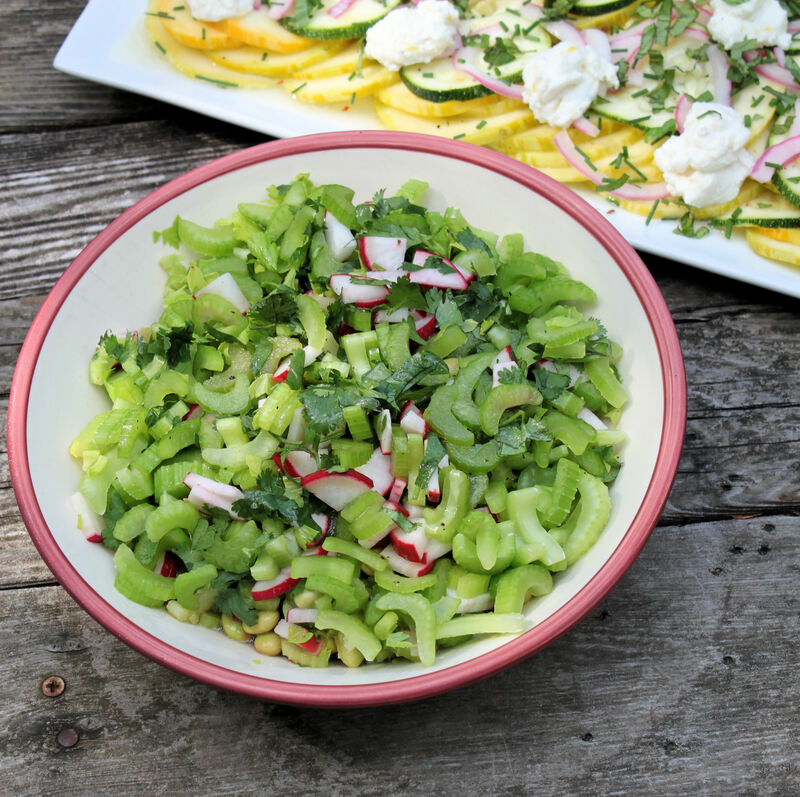 It is a perfect summer salad that takes very little time to prepare with only a small list of ingredients. You will receive many compliments as well! Whisk together the olive oil, lime juice, salt, and pepper until blended. Set aside. Meanwhile, slice the celery, with the leaves still intact, as thinly as possible and place in a bowl. Cover with cold water and ice cubes and place in the refrigerator for 15 minutes for extra crunchiness. If the edamame is not pre-cooked, cook per package instructions. Drain under cold water and pat dry. Remove the celery from the refrigerator and drain as well. 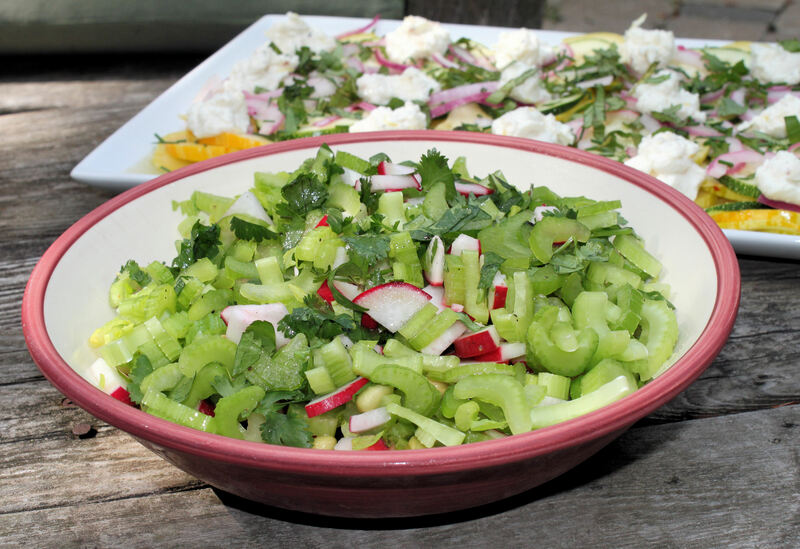 Place the celery, soybeans, radishes, cilantro, mint into a serving dish and mix. Pour the dressing over the salad. Stir and store in the fridge until ready to serve. The longer it sits, the better the flavors will blend. Can be made several hours in advance. This entry was posted in healthy options, salads and dressings, side dishes, vegetarian and tagged celery, celery salad, cilantro, healthy, lime, radish, salads, sides, vegetarian. Bookmark the permalink. This looks really good! I love celery. One question- did you have any leftovers? If so, after sitting in the fridge for a day did the celery overpower it? I’ve noticed celery can get quite strong! It looks fresh and tasty. I like to add more of celery, but this one is also good.